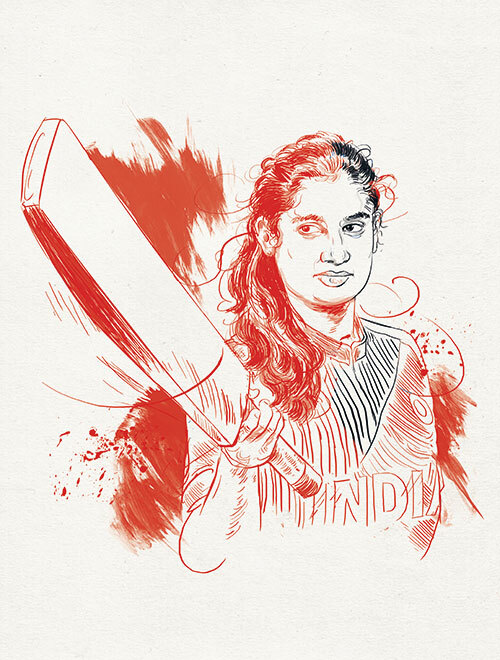 If we were to say that the name Mithali Raj is synonymous with women’s cricket in India, it would not come as a matter of surprise. Taking up the sport professionally at the turn of the century, Raj has added quite a few feathers to her cap since the start of her journey on the crease. Not only did she lead her team to the finals against Australia in the 2005 world cup, but was also instrumental in their first Test victory against England in 2006, taking the Asia Cup home in the same year. The Arjuna Award winner also began 2017 on a sweet note, becoming only the second international woman cricketer to score 5,500 runs in ODIs. I wanted to be a classical dancer when I was growing up, and learnt Bharatanatyam for eight years. That was my passion for a while. Since my father was from the Indian Air Force, my parents led a disciplined life at home and wanted to inculcate in us the habit of rising early. They enrolled me for a cricket camp where my brother also used to practise. It was my dad’s dream that I turn to cricket professionally. When I broke the world record for the highest individual score in a Test innings in England in 2002, I couldn’t comprehend what a feat it was. There was hardly any coverage as we were not under the BCCI then. When I came back home, ministers came to receive me and there was a huge gala. That’s when it hit me that this was something big. That got things rolling for me personally as well as for women’s cricket. It’s far easier to overcome challenges you face on the outside than those within — to focus when your body is tired. Injuries mentally and emotionally drain you, but you have to put in your best when playing for your country. At my peak I played with a lot of injuries, and that was quite a task. When I started my innings in the game, I never had a woman cricketer as a role model, because I’d never seen or heard of them. Today, when I see people coming up to me at airports and restaurants to say that they follow women’s cricket because of me, it’s such an achievement. It was a sport that had no value before and now people follow it. As a cricketer, if you’re labelled as a ‘lady Sachin Tendulkar’, it’s a huge honour. In the cricketing world, no one can achieve half as much as what he has done. Any comparison with Sachin is a privilege, because he’s still the god of cricket. But as a woman, I have come up not to ape someone, but to create my own identity. I would want people to know me as Mithali Raj of women’s cricket, or have another girl be called the next Mithali tomorrow. A career in sports has taught me to be compassionate, no matter what kind of lifestyle you have. I’m also very flexible as a person — we’re able to adjust to anything due to the constant travelling. It gives you strength to go through the trials of life. I admire Rahul Dravid for his personality and his work ethic. Roger Federer is another player I look up to — he’s brilliant at his game even at this age. My parents have also been an inspiration. Being from a middle-class family, it was a huge thing in the ’90s to have your daughter pursue a sport that was not popular among women. If one has to make it big in sports, it is imperative that you have support from some quarters, be it family or coaches. Else it’s very difficult even in this age to reach a certain level, especially for women. Any sport involves discipline and a routine which sometimes could become monotonous for a beginner. I’ve enrolled for a sports psychology course; it’s something I’m looking forward to pursuing. No matter how talented players are, some find it hard to handle the pressures of their sport. It’s important to have someone monitor their progress, mentor them, and help them rise. With this degree, it will be easier for me to understand and help upcoming players.